ARTHRI-SUPPORT™ Cream is a soothing and medicated analgesic rub, offering deep penetrating therapeutic pain relief of minor aches and pains associated with arthritis, backaches, sprains, bruises, strains and stiffness. ARTHRI-SUPPORT™ Cream is formulated to offer temporary relief of minor aches and pains associated with Arthritis, Backaches, Sprains, Bruises, Strains and Stiffness. 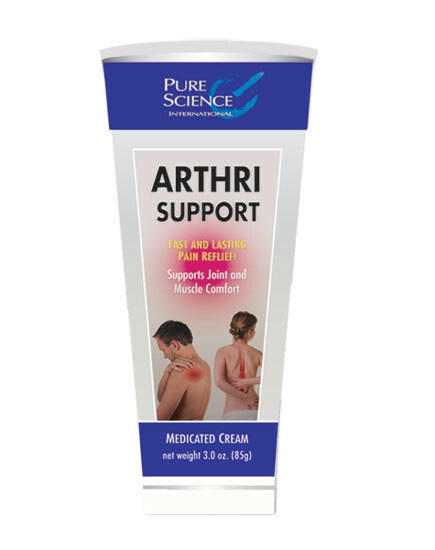 ARTHRI-SUPPORT™ Cream is not one of those mass market creams that simply warms problem areas and does nothing to relieve painful discomfort. ARTHRI-SUPPORT™ Cream is designed to aggressively relieve aches and pains, while supporting increased mobility of joints and muscles. Clinically shown to provide relief for up to 8 hours after just one application.